The History of the Polyphonic Group "Claudio Monteverdi"
The Polyphonic Group "Claudio Monteverdi" was established in 1976. By engaging in an intense study, could soon join the most important events of prestigious choralcompetitions earning statements in Arezzo and Ravenna in 1978 and 1979 and Gorizia in 1982. During the years, the activity of the “Monteverdi” developed itself with numerous concerts in the most important cities of Italy, Germany, Austria, Holland, Belgium, France, Luxembourg, Switzerland, Spain, Hungary, Slovenia, Russia, Canada, United States, Czech Republic, Malta, Slovakia, Sweden, Lithuania, Poland, Portugal, followed by enthusiastic critic and press reviews. The Choir was also invited for three years in a row to the Musical Festival “Karinthischer Sommer” in Villach and Ossiach (Austria), and for two years in a row to the “Internationale Musikwoche” in Millstatt (Austria). Concerning the repertoire, sacred and secular polyphonic music certainly represents the most relevant part of it, with a special attention for rarely executed pieces. The repertoire includes 1500’s pieces, as well as Baroque ones by: Palestrina, Da Victoria, Gallus, Viadana, Hassler, Monteverdi; of Romantic authors such as: Schubert, Schumann, Mendelssohn, Sibelius, Rossini, Rheinberger, Tomadini and of modern executioners like Poulenc, Kodaly, Bardos, Pizzetti, Orff and Dipiazza. Monteverdi Choir has got in its repertory and it has performed all the choral male music by Francis Poulenc. Traditional Folk singing is also included, always mould on the Choir’s musical needs. And for this very reason, the diffusion of traditional folk singing, the “Monteverdi” Choir promoted from 1986 to 1996 a unique cultural initiative: the publication in five volumes of a series of organ Friulan popular music, elaborated by Maestro Orlando Dipiazza, especially for school education and amateur choirs. 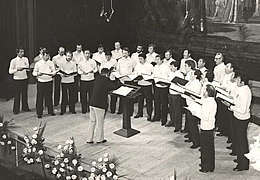 The “Monteverdi” Choir has been conducted until 1996 by Maestro Orlando DIPIAZZA. From July 1999 to December 2007 the choir was directed by Maestro Stefano SACHER. From January 2008 to September 2016 the choir has been directed by Maestro Matjaž ŠČEK, while from October 2016 the artistic direction has been entrusted to m.a Mira FABJAN. The “Monteverdi” Choir is mentioned with photos and reviews on the Monographic Encyclopaedia of Friuli Venezia-Giulia. Since January 2003, it has been recognized by the Regional Assessorship for Education and Culture of the Region Friuli Venezia-Giulia as “cultural organism of Regional relevance”. In 2009, the Polyphonic Group Claudio Monteverdi was awarded the "certificate of merit" of the Lithuanian Ministry of Defense for their cooperation with the female chorus of the Lithuanian Armed Forces "Guoste". In 2014 the Polyphonic Group Claudio Monteverdi participated in the "Queen of the Adriatic Sea Choral Festival and Competition" in Cattolica (Rimini), getting second place in its class and third overall at the Grand Prix. As part of the celebrations for the anniversary of the Republic Day, in 2016 the choir was awarded the prize "Maltese Cross" by the municipality of Ruda, for the 40 years of uninterrupted musical, for the promotion of Friulian folk music and for having made known, with the International Festival "Choirs of Europe", the region and its peculiarities to choirs from all over Europe.